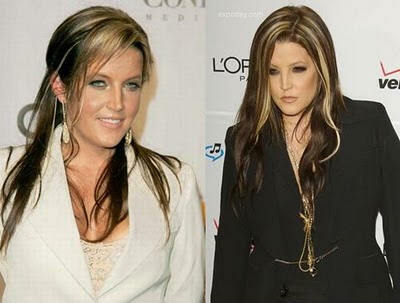 Reptilian Being (elite): Perfect example is, Lisa Marie Presley. Get pics of her, whenever you can. This should be easy, because she is so very famous. Study her face closely. See the jaw, how it always comes to a perfect needle point? ICE blue, cold-steel eyes or Black eyes, completely devoid of any light. Perfect chisled features, very sexually inviting male or female form. These are the elite in the world, the so-called Jet-Set society. Beautiful to a pain, but always the same, repeatable features among their few types. All other reptilians, grays, hybrids, human sell-outs, bend a knee to this level. Fortunately, they are the fewest in number of them all. And, they are the top-controllers in the Dark Game, Bar None, save from the Beast Itself. Their beauty burns up quickly, my research has turned up. The women wear esp engineered and beautiful bodies, but by the time most of them are 35 years of age, they look horrible. Example: Farrah Fawcett Majors, reptoid elite. Five center being. Many have wings, putting them on par with the dracs, which is what they are really, more than reptilian. Both species are lizards, so to humanoids like us, I guess it doesn't matter much. Hive consciousness being, with animal telepathy among themselves and those under their control: grays, reptoids, hybrids, other elites, the possessed, and those under MKultra, with demons installed in their solar plexus.